The Bechdel Rule was introduced in Alison Bechdel's comic "Dykes to Watch Out For," in a strip called The Rule. The strip was published in 1985 and Bechdel credits the rule to her friend Liz Wallace. Thanks Liz! In the strip her friend states that she only sees a movie if it satisfies the three basic requirements listed above. I find myself naturally seeking out movies that satisfy the Bechdel Rule as a balance to all the male heros and anti-heros in film and television. There are a lot of great movies that do not pass the Bechdel Rule and I can enjoy them immensely, but it is not enjoyable or satisfying to watch them exclusively. They are only half of a whole, they're all yin and no yang. Some take the test very literally and any conversation, no matter how short, between two women in a movie satisfies the rule for them as long as it is not about any man. A two minute conversation about potato salad in a 2+ hour film satisfies the rule for some. For me it does not. The potato salad exchange does not even pass for a conversation, it's completely superficial, and has no importance in the movie or in the lives of the female characters. For others Zero Dark Thirty does not pass the test because Osama Bin Laden was the only thing the female main character spoke about with any other character including her female coworker. For me it passes the rule because the man she speaks about is the sole focus of her work, her very important work. She may be defined by her work but she is not defined by this man and this man is not her love interest. 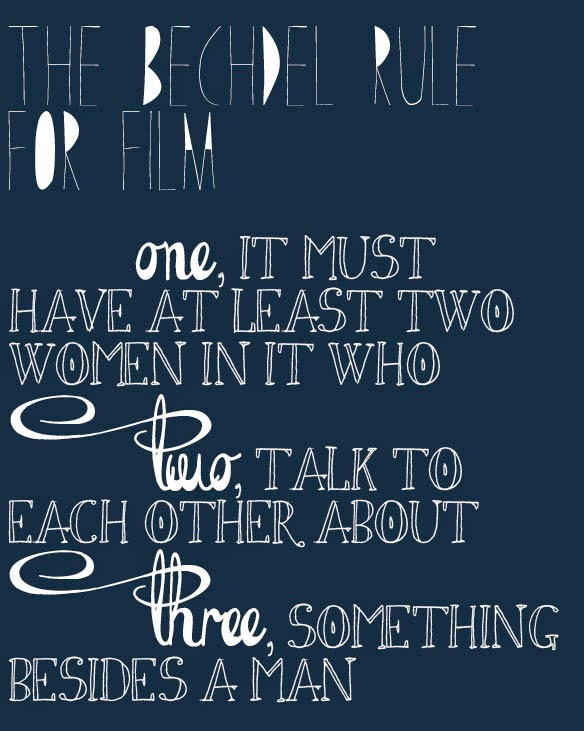 Maybe the Bechdel Rule was meant to be taken literally. Maybe in 1985 if it was not taken literally Liz Wallace would not have been able to see any Hollywood film. There are still so many that don't pass the rule. I believe that applying the test literally, as in the examples above, completely ignores the spirit of the rule which is to assess the presence of women in movies. Meaning, it should asses whether or not women are represented by three dimension characters. Is there is more to the female characters than just how they relate to the men in their lives? Does the film show the female characters' friendships, family, work, talents, concerns, problems, personalities, successes, and/or flaws? And if I'm wrong about taking the Rule literally it's time to rewrite the rule. It's 30 years later and time to raise the bar a bit on the entertainment we consume. 3, something other than a male love interest. For me, this criteria satisfies my need to see women depicted as three dimensional human beings in art and entertainment. It is only when this criteria is met that I feel a strong personal connection to the work. Again, I do not need to feel a strong personal connection to every film and television show. I have really enjoyed Breaking Bad as much as the rest of America without relating to it on a personal level (one would hope!). But, my entire entertainment portfolio, for lack of a better word, can not be made up of Breaking Bads. I desire more of a balance between humor and drama, realism and fantasy, feel-good and violent, sexual and asexual, male and female. 95% of the films, television shows, and books I have, and will, discuss on this site satisfy my interpretation of the Bechdel Rule. Feminist Frequency has a great short video introduction to this topic and some very interesting links for your reading pleasure. I also highly recommend Alison Bechdel's graphic novel Fun Home: A Family Tragicomic. This memoir is heartbreaking, humorous and downright intriguing. Give it a whirl when you're in the mood for something different than the traditional novel.